A seasonal affective disorder lamp is the most commonly prescribed form of treatment for individuals suffering from S.A.D. These are specially designed lamps that provide light similar to the light you would be exposed to outdoors. It is lack of exposure to this outdoor light that triggers the symptoms of S.A.D., which can include depression and insomnia. By controlling the amount of light you are exposed to on a daily basis you can help to relieve symptoms. Seasonal affective disorder, or S.A.D., is a recognized condition that occurs mostly during the Fall and Winter when exposure to daylight is limited. The body requires this exposure in order to trigger the production of certain chemicals, including serotonin and melatonin, which help to regulate sleep patterns and produce a sense of well-being. Seasonal affective disorder light therapy can help to ensure that the body is getting the correct light exposure at all times. When daylight exposure is limited, the body's natural circadian rhythm can become impaired, leading to difficulty sleeping and insomnia. At the same time, individuals may become irritable or depressed. S.A.D. is a very common complaint particularly in areas with longer Fall/Winter periods. For these individuals in particular, a seasonal affective disorder lamp can have a major impact on the quality of life. Because the light that causes the symptoms of S.A.D. 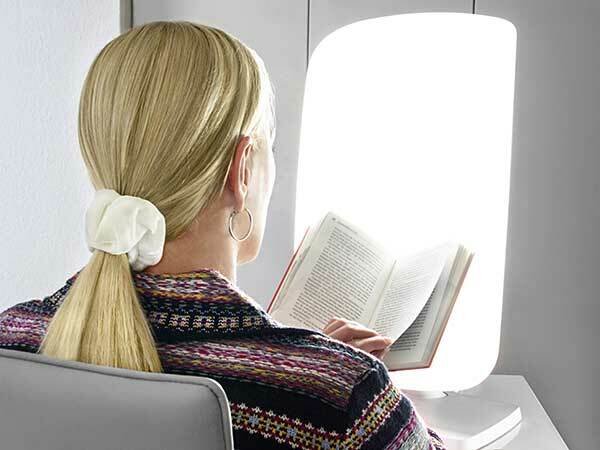 is very unique, so too are the lamps used for seasonal affective disorder light therapy. It's not as simple as turning on a table lamp or ceiling fixture. Therapy lamps are designed to provide exposure at up to 10,000 lux, usually for 20 to 30 minutes at a time, although specific session times may vary depending upon individual need. Since a seasonal affective disorder lamp is meant to trigger responses in the brain by sending signals through the retina, it is necessary for users to have their eyes open during treatment, although it is not recommended that they look directly into the light. For this reason, most S.A.D. lamps have built-in UV protection to avoid damage to the eyes. While the specifics of treatment can vary in terms of length and timing of sessions, in most cases seasonal affective disorder light therapy involves sitting with the lamp about 1-2 inches in front of the user for the 20-30 minute span. For the most effective results, doctors recommend engaging in these sessions within the first hour of waking up in the morning. Certain S.A.D. sufferers may also need a session in the late afternoon or early evening. Although you can purchase a seasonal affective disorder lamp without a prescription, it is always a good idea to check with your doctor first before beginning treatment. This is particularly true for individuals who are taking anti-depressants as light therapy sessions can sometimes trigger manic episodes in these individuals. Your doctor can recommend exactly the amount of time to use your lamp and how often to use it. For most S.A.D. sufferers, light therapy begins before symptoms reach their worst and can usually be tapered off in the Spring when natural daylight becomes stronger. Again, it is always a good idea to consult with your doctor to make sure that you are getting exactly the treatment you need without taking any risks. Done properly, light therapy can help you manage your S.A.D. symptoms and get back to enjoying your life all year round.